It isn’t easy to decorate a bathroom. The space lends itself to waste, with messes sprouting up on a daily basis, just through regular use. What is worse most of the room in the bathroom, what little room there usually is, is filled with immovable structures that have been there ever since you moved in. Generally these structures, the sink, the bathtub, the toilet, etc. can’t be changed or replaced without a major expense and some messy construction. But you can’t just ignore these fixtures; any element which you add to this room has to blend in harmoniously with the rest of the space. Blending your own taste in with the existing personality of the room is they key to decorative success without a construction mess. With few exceptions, the bathroom is the smallest and most crowded space in the home. An overstuffed closet may be a little bit tighter, but a closet doesn’t really need to have an attractive decorative scheme. The first thing you have to do is ensure that your space is organized in such a way that it functions smoothly. You don’t want to have to claw around your cabinets at 6 AM when you’re groggily getting ready for work. You should try and maximize whatever organizational structures already exist within the space. If you have a medicine cabinet, compartmentalize and divide up its contents. Depending on the size of the cabinet and the amount of room you need, you may want to reserve this space for just medical supplies, and leave other bathroom accoutrements elsewhere. A second cabinet can be a great place to store brushes, hair pins, various sprays, pastes, and ointments that are used when outside of the bathroom. Inside of the shower / bathing area, you should have some sort of structure for storing soaps and shampoos. A soap dish can be difficult to clean, and a bit small, so you may want to invest in some hanging shelves. These are often available in a variety of plastic and Plexiglas materials and can fit into most shower setups. Since space, especially work space is at a minimum you have to make sure that you use all surfaces when considering your bathroom decorating scheme. This includes the floor, the walls, the windows, and even to some extent the ceiling. The walls are going to be your main canvas. They are pretty much wide open, and provide you with all of the space that you need to personalize the room. You can choose to hang print, portraits, or posts in this space; however you do have to take into account the wet nature of a bathroom. There will be splashes, there will be splats of soap and lotion, there will be grime and there will be messes. This is the nature of the space. Therefore, it is important that you choose media which are water proof, and stain resistant. You also probably don’t want to be putting anything expensive or irreplaceable into this space. Clear plastic covers, or even glass encasing can go a long way to protect certain items, but you are always taking a risk in the bathroom, so use care. The floor of the bathroom is less of a centerpiece to the space; however it does add its own important element to the overall ambience of the space, through texture. The way that the floor of a bathroom feels when you have shoes on can give the space either a sense of straight line rigidity, in the form of cold hard ceramic tile, or squishy warmth and comfort, in the case of soft area rugs and fluffy bathroom pieces. In a bathroom however, you will often be barefoot, and so the feel of the floor is much more important here than in other spaces. Just think, its 6AM, you stumble bleary eyed into the bathroom, your bare feat treading the solid carpet of your hallways, until you reach the bathroom and take a step in, and are shocked by the freezing cold sensation of hard lifeless tile. It could be a pretty unpleasant sensation. Or it could be invigorating. That’s a personal choice, but its one which you have the power to make. While it is important that your bathroom be well lit, so that you can see what you are doing and everything that is going on, usually this will have already been taken care of by the time you move in. Most bathrooms have at least an overhead fixture, and some actually have a light built right into the mirror piece. There are a few accessories that some people get, face lamps, and extra mirror lights, which are very effective in adding to the illumination of the room, but overall you shouldn’t need much more than what is already provided. The one place where you may want to consider controlling the light however is through a window. While most windows in bathrooms are either semi-opaque, or are covered over by curtains, you still get a little bit of sunlight through that space. This can be enhanced through the use of transparent glass artwork or window pieces. These can be made from either clear colored plastic, or more elaborately, from stained glass. They have the effect of not only adding colorful light throughout the space, but they can also be a powerful eye drawing accent within a room. It goes almost without saying that your accessories should match one another. They should also match the existing structures. If your bathroom is made up of Victorian furnishings, don’t try to mix it in with stainless steal accessories. However most bathroom styles will give you some room to mix and match. Hardwood cabinets can be matched with other woods, or alternatively with straw and thatch. Aluminum is a better match for stainless steal, although some of the darker stained hardwoods are also a good compliment. 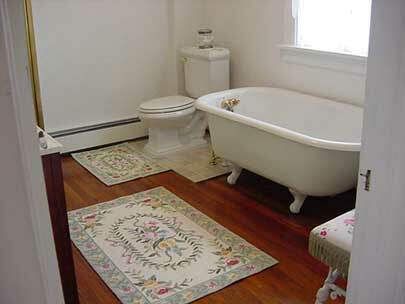 Often when purchasing bathroom decorative items, people overlook more transient pieces, such as towels and washcloths. These temporary items, which cycle in and out with use, are an amazing opportunity to customize the look and feel of your bathroom on a regular basis. Different colors of towel, and linens, can have a dramatic effect when hung on a door, or even folded on a shelf. By choosing a focal item in the bathroom with a particular pattern, you can steal the colors of your accessories and linens from that pattern, using it as a cheat sheet to create a multicolored matching decorative scheme. In this way no matter which towels you pull out of the laundry first, you know they will always match up with everything else in the room. Bathroom decorating can be challenging. You have a room that invites messes, and incites visions of mold, which is small, and expensive to remodel. It has a million uses, and no room for any of them, and usually it’s being shared by multiple people. However, a little creativity and planning can go a long way to helping you dress up the space. You have to make maximum use of what space you have, walls, floors, possibly even the ceiling, while at the same time maximizing the organization of the room to ensure that it remains functional. If you can manage to balance these competing necessities, then you have a good chance of developing the bathroom of your dreams. This entry was posted on Wednesday, September 24th, 2008 at 3:06 pm	and is filed under Decorating Articles. You can follow any responses to this entry through the RSS 2.0 feed. You can leave a response, or trackback from your own site.